Spirulina isn’t the sort of food you want to spread on toast or eat in a gourmet restaurant, but its bland taste doesn’t make it any less amazing. Considered a “superfood,” this algae grows in salt water and is dried and stored in powder form. Just one and a half pounds of this stuff can provide enough nourishment to keep a full grown man alive for an entire month! Spirulina algae offers humanity’s best chance of growing a sustainable food supply in outer space. Since it can feed off our waste products like carbon dioxide and treated sewage, it’s an extremely important link in the sort of isolated nutrient cycle found on board a space station. I first discovered spirulina from the book “sailing the farm.” It’s a book that delves into tremendous detail about every type of plant that can be grown on a boat or harvested out at sea. The guy who wrote, Ken Neumeyer, spent decades living at sea and he’s cataloged every technique he used to feed himself using nothing but oceanwater and sunshine. Spirulina is tropical, so many Americans and Canadians will need to grow it in a heated room or greenhouse. It’s often grown in 5 gallon jugs of water. It grows so quickly that a single test tube starter will divide and conquer an entire 5 gallon water jug in just 2 weeks. The finished product is actually very valuable. Most spirulina is sold by the health and fitness industry. Its 60% protein content makes it perfect for the market of men wishing to look like Minotaurs. It’s an extreme niche crop, but if you can find a market for it you can do quite well as a spirulina farmer. Spirulina sells for about $20 a pound, making it about twice as pricey as coffee for a tiny fraction of the effort! According to “Sailing the Farm,” you just need a few materials to get your own spirulina farm going. The instructions in my copy of “Sail the Farm” don’t go into the specific details for growing your own spirulina, but I’ll update this page when I’ve found a good step-by-step process. We’re planning to grow our own supply of Spirulina this summer. Sorry, but do you mean “spirulina”? To tell the truth, I’ve never had so much trouble with the spelling of a word before in my life. Hi, interesting post! We actually DO like the taste of fresh spirulina spread on toast! Not many people can get it fresh so maybe that’s why the taste is not well known, it’s much nicer than the dehydrated version! 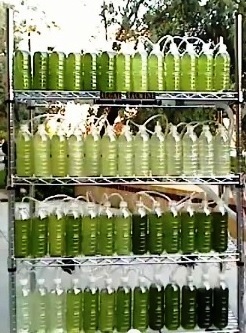 Anyway, we teach people how to grow Spirulina in Mexico. Hope you will take a look at our site for ideas, it’s all in Spanish but feel free to write to us. Hi! I am looking for live spirulina to start my own, can someone help me find some in Canada. The only one I have found is in the States and they don’t ship it to Canada because of the customs! I live near Montréal, any help is welcome for me to get started! I am also looking for a starter. Okay, it’s fall. How’d it go? Cool article. Any step by steps yet? I really want to make some in my glass 3gal. jug! we need spirulina live starter culture. any one from you can supply to us and let us know the cost of the live starter culture. I know my neighbour has half a dozen pools growing spirulina. He does workshops in the philippjnes… Mr. Guevara, search facebook for GeoFarm777. Since you are in malasya, a package from philippines should arrive in 5 days and the spirulina should be alive while a package from canada should take 30 days and the spirulina would die. Does anyone have link that really describes a step by step method for growing spirulina? Can someone provide live spirulina in Romania,or near? Does anyone know a place I can buy live spirulina in New Zealand? I am dong a science fair about spirulina as a food source and I want to grow some.